A crispy potato skin is a vessel that can be filled with so many delicious combinations. There's nothing wrong with melted cheddar, bacon, sour cream and chives but give this a try instead : soft, warm feta (or goat cheese), kalamata olives, sun dried tomatoes and fresh oregano. What about bacon? Sure, why not. It's never a bad idea to add bacon to potato skins. In this recipe for Greek potato skins, prosciutto can be used instead for salty, meaty flavor. Pierce each potato several times with a fork. Place the potatoes directly on the oven rack and bake until a fork easily pierces the potatoes, about 50 minutes. When potatoes have cooled enough to handle, slice each potato in half lengthwise. Scoop out the flesh with a spoon, leaving just a little bit of potato flesh in the skin. Brush the inside and outside of potato skin generously with extra virgin olive oil and season with salt on both sides. In a medium bowl, mash together cheese, sun dried tomatoes, oregano and olives (and prosciutto or bacon, if using). Set aside. Place the potato halves skin-side up on a baking sheet and bake until crispy, 12 to 15 minutes. Flip the skins over and fill each one with a scoop of the cheese mixture. Return to the oven and cook 5 to 10 minutes more, until the cheese is soft and warm. Keep on eye on the potatoes, making sure the edges don't burn. 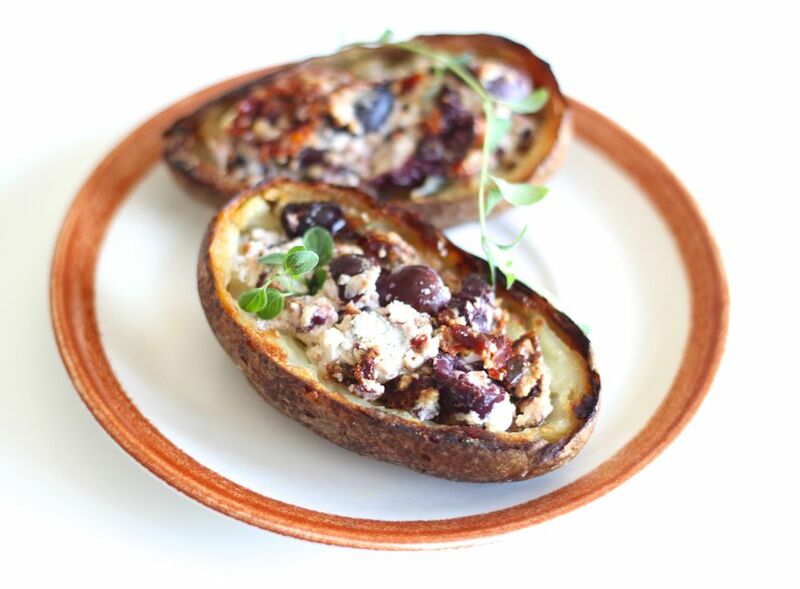 Serve Greek potato skins immediately, while still warm. What Should I Do with the Leftover Potato? One thing about potato skins is that you're left with extra potato flesh. Don't waste it! You can simply mash it up with with butter and salt, or make potato soup or potato croquettes. Fresh oregano has a strong, pungent aroma and flavor. Used in small amounts it adds a bright, herbal flavor to food. Mediterranean fresh oregano is part of the mint family, and has a similarly clean, fresh flavor. Dried Mediterranean oregano has a milder flavor and aroma. However, dried Mexican oregano is bolder and has a stronger aroma. It can have a slight lemony or licorice-like character. Dried Mexican oregano can be harder to find in regular grocery stores, so look for it in Latin markets.